Drie and I headed out to Lansing for Scott Kelby's Worldwide Photowalk, our first organized Photowalk. Toward the end of the route was construction on a sewer project which closed a street and parking along some others. 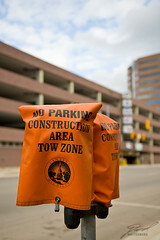 I found the bags they placed over the meters in front of the parking structure to be funny. I ended up shooting two version of essentially the same photo though and I didn't think the shallow depth-of-field conveyed the humor of the situation. The one with the "PARK" sign in focus just didn't seem interesting any more. So, I uploaded both.